In our last article, we presented 3 beautiful ways to integrate open shelves in your kitchen. Well, this week, we decided to inspire you to organize your shelves (and even your cabinets) to make you feel like all the culinary bloggers you follow on love on Instagram. If you recall, we’ve been working with blogger Christelle (Christelle is flabbergasting) for a couple of years now. 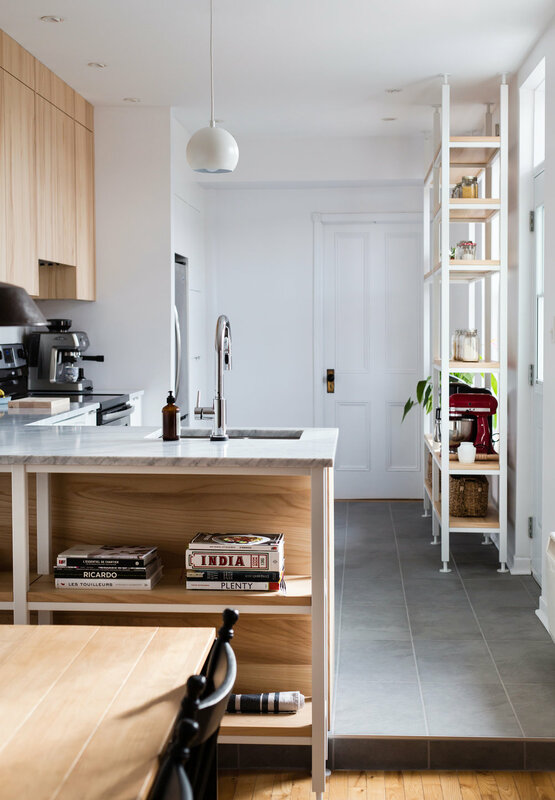 When we designed her kitchen, Christelle chose to make the best of both worlds by mixing open shelving and closed cabinets. That meant she had to find a way to style her shelves to make it aesthetic and coherent with the rest of her kitchen. So, here are our tips inspired by Christelle’s work in her kitchen. Instead of hiding all her dry ingredients in your pantry, Christelle decided to make them the centre of attention of her kitchen by organizing them in different see-through jars. Play with sizes, shapes, and types of jars to give rhythm to your shelves. Also, if you’re like us and you’re becoming more and more conscious with environmental issues, using Mason jars or any recycled jar is a great influence to buy in bulk. By doing so, you consume less packaging (because you can fill your jars directly in the store, rather than buying bags) and you waste a lot less since you’re the master of the quantity purchased. This storage tip becomes as practical as aesthetics. What better than a plant to bring more life into your kitchen? Christelle’s kitchen baths in the sun all day, and her plants are loving it! You don’t have a green thumb? No worries! There are so many plants to choose from that requires next to nothing (Hi cactus!). There is no need to take on a major project here! To give it a more industrial look, give a second life to your tomato cans just like Christelle did. You have kids? Buy some cheap and simple flower pots and have them decorate them. The possibilities are endless! Even though they say we are not supposed to judge a book by its cover, take advantage of your shelves to put your favourite cooking books on display. Give your kitchen even more character by displaying your old, overused cooking books that your grandma gave you. Just because your tableware is hiding behind closed doors doesn’t mean you like it less or that you forgot about it. Keep your dishes and favourite cookware handy in your easily accessible cabinets. Have fun with the layout and theme of your cabinets and never forget that a well-organized cabinet will make you as happy as a well-organized open shelf. Play with colours and don’t hesitate to mix and match your tableware to add a little touch of originality to your day-to-day life and your table. There you have it! We hope we inspired you a little. And don’t forget, it’s the small details that make the great kitchens.